As the industry that introduced the traditional six-axis robotic arm to its production lines in the early 1960s, according to some the automotive sector has stayed somewhat stagnant when it comes to innovation. 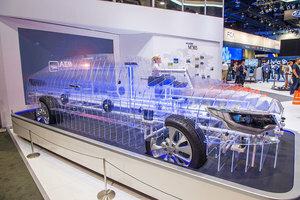 However, in the past few years the race to design and build self-driving cars, augmented reality windscreens and additive manufactured parts has started to gain speed, observes, Mark Proctor, managing director of industrial automation supplier, European Automation. 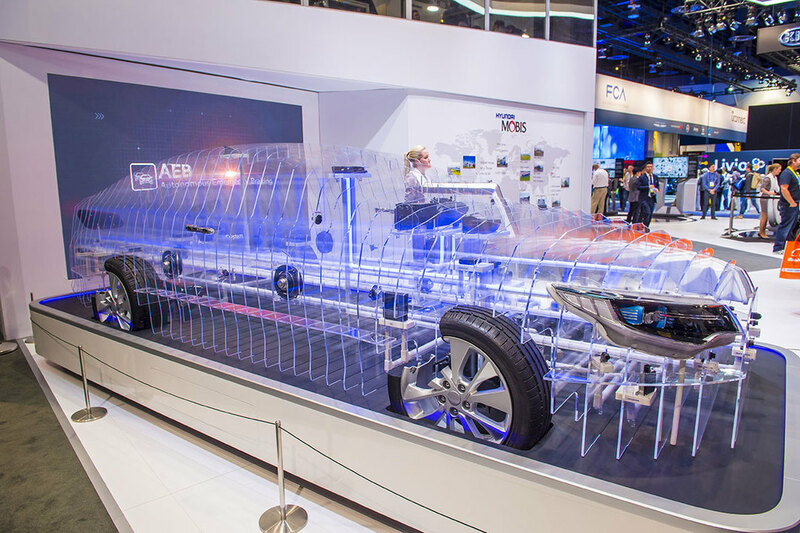 At the 2015 Consumer Electronics Show, autonomous and electric vehicles took centre stage. BMW explored the possibilities of laser-powered headlights, Mercedes unveiled its luxurious self-driving model and Toyota encouraged manufacturers to consider building fuel-cell powered vehicles, following its own Toyota Mirai fuel-cell car release the year before. With such rapid changes in automotive design, it is surprising to discover that many car manufacturers are using traditional production lines. “Despite predictions by Google that over ten million autonomous vehicles will be on the road by 2020, many industry experts are sceptical. Let’s face it, it took mobile phone manufacturers ten years to progress from an old school brick-phone to a handheld flip one and it’s going to take much, much longer to safely mass-produce a fleet of self-driving, road-safe cars,” says Proctor. Even so, it seems that manufacturers are feeling the pressure. Changing market demands are forcing automotive manufacturers and the original equipment manufacturers (OEM) of their assemblies to be more adaptable. As a result, the industry is seeing much of its older, traditional machinery fall into obsolescence. However, for an industry with increasing competition, growing energy costs and an ever-shortening time-to-market expectation, the downtime caused by a complete overhaul of older machinery in favour of new equipment could be detrimental. To maintain high levels of productivity, while adhering to external pressures concerning energy management, automotive manufacturers are beginning to seek out Eco Obsolete Technology (EOT). EOT describes industrial automation parts that are still compliant with current energy efficiency standards, despite their production being discontinued by the OEM. 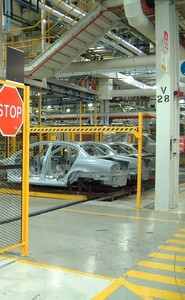 EOT plays an important part in today’s fast-paced manufacturing world. With technology evolving at such an incredible pace, the term obsolete doesn’t always mean the machinery is aging. Choosing a new part or system isn’t always as easy as it may seem. The decision to upgrade could result in costly downtime, excessive equipment and installation costs and potential problems when integrating the part into the existing infrastructure. 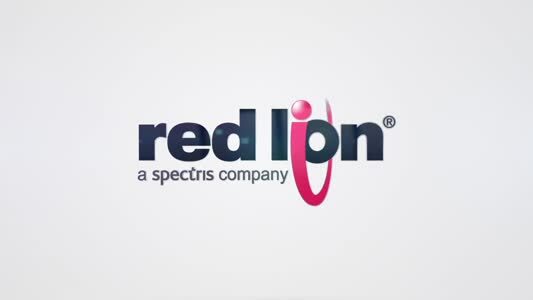 Thankfully for manufacturers faced with this decision, obsolete industrial automation suppliers are never too far away and can help avoid this headache. Using an extensive range of partners from around the world, a good supplier of industrial parts can locate the components you require, regardless of whether they are modern, standard, new, used or obsolete. The length of service life of units and systems is one of the most important requirements in mechanical engineering. In order to prevent system failures, control components (which are subjected to a thermal stress that depends on the load placed on the machine) require climate control. 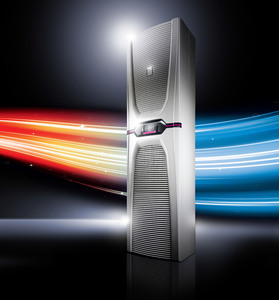 Test results at Audi AG are showing that Rittal’s new generation of “Blue e+” cooling units can result in energy savings of 75 per cent for enclosure climate control, compared to conventionally regulated cooling units. Comparative measurement of the new development with two other cooling units from Rittal is being carried out in tests on three enclosures. The Blue e+ is being compared with a cooling unit of the current TopTherm Blue e series and an older cooling device. The first results confirm the performance measurements achieved by Rittal during development. “Compared with the current TopTherm Blue e systems and under the same conditions, we have so far achieved energy savings of 75 per cent with the Blue e+ unit in cooling this production control system,” says Andreas Korn, of Audi AG's Automation Technology Planning Division. The “Blue e+” devices cover a power range of up to 6000 watts (previously up to 4000 watts) and can therefore be used at temperatures ranging from -30°C to +60°C. Depending on the development stage, the new E-Clutch system from Schaeffler either operates the clutch only under specific driving situations, or completely automates all clutch operations. This enables fuel saving driving strategies, from “sailing” to electrically supported driving, to be integrated into vehicles with manual transmissions. “The E-Clutch from Schaeffler paves the way for hybridisation of manual transmissions, thereby opening up new markets and market segments,” said Uwe Wagner, Vice President Automotive R&D at Schaeffler. Up until now, this has been possible only in combination with automatic transmissions. 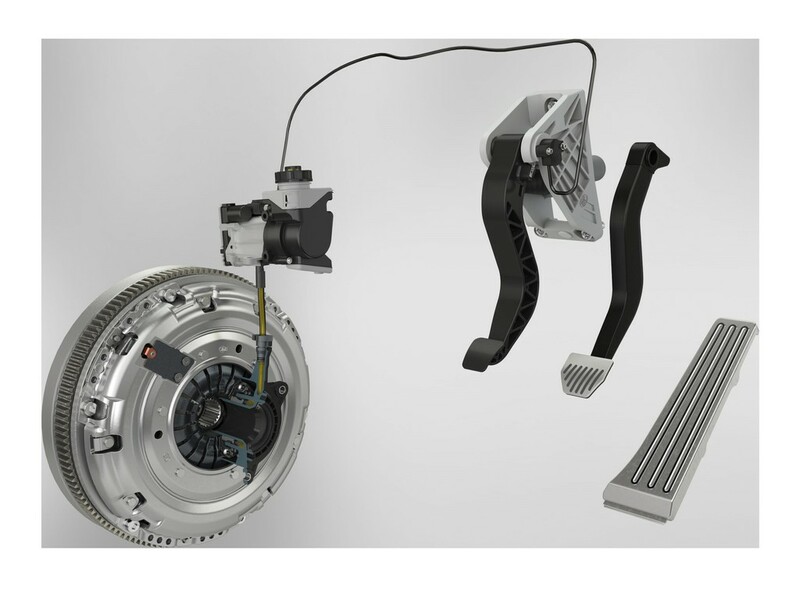 Schaeffler has developed three stepped concepts for the E-Clutch for manual transmissions depending on the level of automation required. In the MTplus version, the basic principle of transmitting forces hydraulically is maintained but with the addition of an actuator directly in the pressure line. In this arrangement is the demands on actuation times and the number of actuations are lower, resulting in reduced demands on performance. Even partial automation makes a significant contribution to reducing fuel consumption when “sailing”. During continuous driving, the engine is disconnected from the transmission and is either completely switched off or idles. The MTplus system disconnects the transmission. The driver provides the signal for this indirectly by taking his foot off the accelerator pedal. Tests conducted using the up-and-coming WLTP consumption measurement cycle and realistic customer cycles have recorded reductions in fuel consumption from two per cent (engine goes to idle) to six percent (engine switches off). Using a 1.2 litre petrol engine demonstration vehicle, Schaeffler has shown that it is possible to achieve savings of up to eight percent in urban driving conditions. In the clutch-by-wire concept, the mechanical or hydraulic connection between the pedal and the clutch release system is replaced completely. The opposing force on the pedal from the clutch release system, which is no longer required, is now generated by a new pedal force adjuster developed by Schaeffler. This contains an additional sensor that sends a signal on the pedal position to a clutch actuator. The driver is therefore not immediately aware of the automatic engagement but continues to drive as normal with a manual transmission. A recently developed, intelligent actuator undertakes the actual opening and closing of the clutch in all driving situations. This consists of a basic actuator that includes all the electronics, the e-motor, and a spindle drive. The connection to the clutch actuation is either mechanical or hydraulic depending on the application. 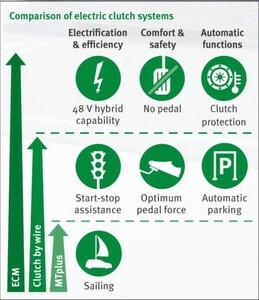 The performance of this technology can be clearly seen in the “Gasoline Technology Car” (GTC) co-developed by Schaeffler, Ford and Continental, where reductions in fuel consumption and CO2 emissions of 17 per cent were achieved with the automatic clutch making a significant contribution to this. Electronic Clutch Management (ECM) is technically based on the same system as clutch-by-wire, but without a clutch pedal. A sensor provides the signal for disengagement when the driver changes gear. Engagement follows automatically once the gear is selected. The high degree of automation in the ECM provides a good basis for integrating an electric motor into the drive train. By using a suitable battery in a 48V on-board electrical system, this system is used to drive the vehicle in all instances when the engine is running inefficiently, for example, when parking, in stop/start traffic or at low-speed urban driving conditions. 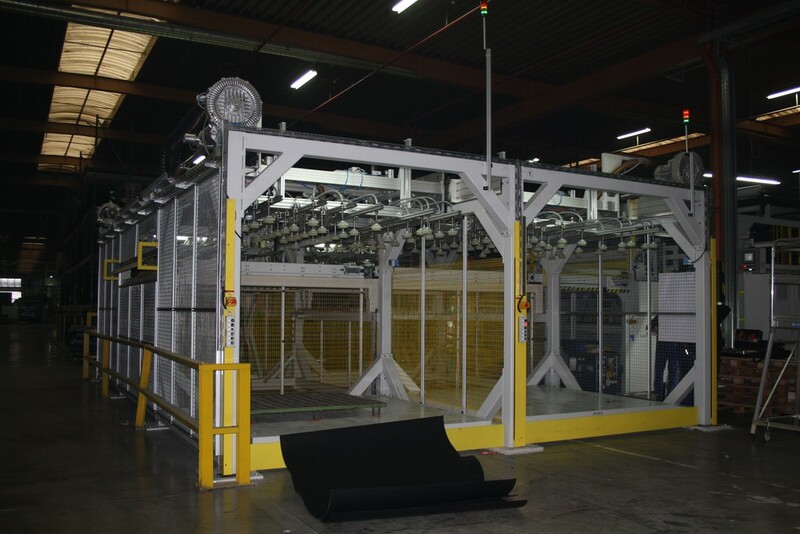 Linear motion specialist, HepcoMotion, has supplied key mechanical components for an automated non woven fabric production machine for a leading in the producer of interior and exterior textile lining components for major car manufacturers. In this application an infeed conveyor supplying the non woven material to be processed, is positioned centrally within the machine. The operation involves putting together fleeces and bonding them in order to produce the final product. 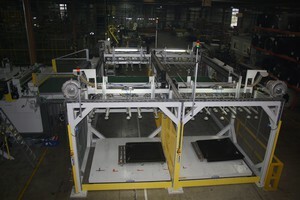 In turn, the finished cut material is fed to a palletising station ready for collection. The palletising speed is vital to the application and, with material under 1 metre in length, they require to produce 20 per minute. 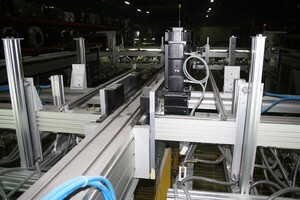 Within the machine, four stations were designed including the palletising position, served by an X motion with a travel distance of 8.2 metres. Two X axes in parallel are linked by fixed Y axes 3 metres long. The Z motion fitted to the Y provides the vertical lifting and lowering of pneumatic suction pads that carry the material to each station. In order to minimise the overall machine size, the X axis motion for the complete machine comprises three Heavy Duty HB33 beams in parallel. The middle beam has a guidance system fitted to both sides that allows two pairs of X axes to work independent of one another. The problem of ensuring that the X axis guidance systems work exactly in parallel, without the need for precision machining, is solved by the use of HepcoMotion proprietary flat track and rollers. These are positioned on one of the parallel axes with the V guidance on the other – this enables inaccuracies in the frame to be accommodated. All X axis guides are Heavy Duty size 33 rack driven with a Lenze helical bevel gearbox and servo motor providing the drive. The integral carriage for the X axis guidance bearings is made long enough to allow the fixed Y axis to be end located, maintaining the overall compact design of the machine. HepcoMotion’s Heavy Duty Compact beams HB25C are used for the Y axes - these are of a lighter construction to the main load bearing X axes but provide excellent rigidity for the location of the Z motion systems. The Z motion suction pads are fitted to an MCS frame; four GV3 NM44 rails located on to an MCS aluminium profile act as the vertical guidance for the frame. The need for reliable plant and machinery on vehicle manufacturing plants is paramount, and it follows that every component must be able to offer guaranteed performance and long term reliability. 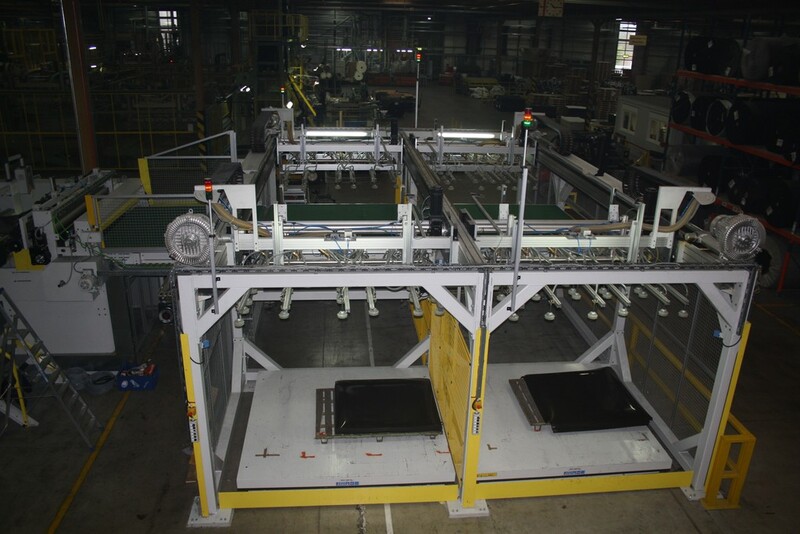 Tsubaki has a long history of supplying conveyor and drive components for automotive assembly lines that have provided trouble-free operation for the full duration of their specified operating life. Tsubaki drive chain, for instance, is used in conveyors, lifts, hoists and many other machines. It is available in a number of different ranges, including roller chain, heavy duty chain and leaf chain, each suited to different duties and different working conditions. The company’s bearing roller conveyor chain features cylindrical bearings embedded within the rollers to minimise rolling resistance and optimise power consumption, especially over long conveying distances. The cylindrical bearings also prevent stick slipping from occurring at low speeds, thus ensuring smooth movement and accurate positioning of the vehicle bodies along the assembly lines. Tsubaki Liftmasters are commonly found in automotive plants to transfer assembled heavy components, such as engines, transmissions, suspensions and vehicle bodies to the next process. The Tsubaki Liftmaster, is a lifter with a screw-type support beam and internal guide, these lifters are installed simply by bolting them into place, their low profile design obviating the need to dig pits in which to locate them. Another configuration of lifter made by Tsubaki is the Zip Chain Actuator, a high speed device that can raise components to the exact level required for rapid yet precise fixing to the vehicle body. Taking away the need for personnel to do exact positioning increases work efficiency and productivity. It also improving workers’ posture, and improves ease of maintenance. Tsubaki Power Cylinders are used to for many duties on automotive assembly lines, including opening and closing the suspension tongs that hold the vehicle bodies on overhead conveyors. These are electrically powered, mitigating risk of leaking oil from hydraulic cylinders dripping onto the vehicles. Installation is a simple matter of connecting the three phase source, rather than having to install hydraulic piping. Brunel University has recently opened an on-campus car component research facility – the Advanced Metal Casting Centre (AMCC). 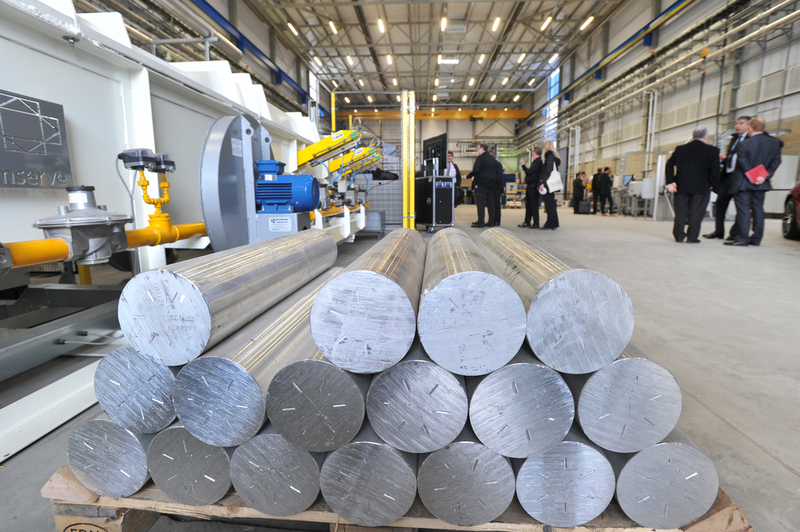 The £17m,1500m2 building is funded by the Engineering and Physical Sciences Research Council, Innovate UK, global aluminium component producer Constellium and car manufacturer Jaguar Land Rover. The primary aim is to scale up from fundamental research carried out in the Brunel Centre for Advanced Solidification Techniques (BCAST) and the Liquid Metal Engineering Centre (LiME) under Professor Zhongyun Fan. Professor Fan and his team have demonstrated how it is possible to condition molten aluminium alloys to produce castings with a much finer grain structure so car components can be made up to 40 per cent lighter. The same techniques also hold out significant promise in making mixed aluminium alloys scrap a suitable material for high quality castings. Currently such scrap is difficult or impossible to recycle to a high enough quality for re-use in automotive manufacturing. Advanced Metal Casting Centre (AMCC) working to make car components up to 40% lighter.